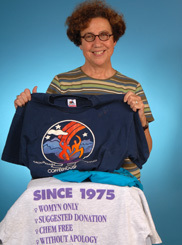 Munzer was a long-time member of the Mountain Moving Coffeehouse collective, producing hundreds of women's music and culture events. She is a supporter of numerous feminist and lesbian charities. Her other volunteerism includes Wages for Housework and ILS, the Institute of Lesbian Studies. She has worked nearly three decades in social service with the state of Illinois.